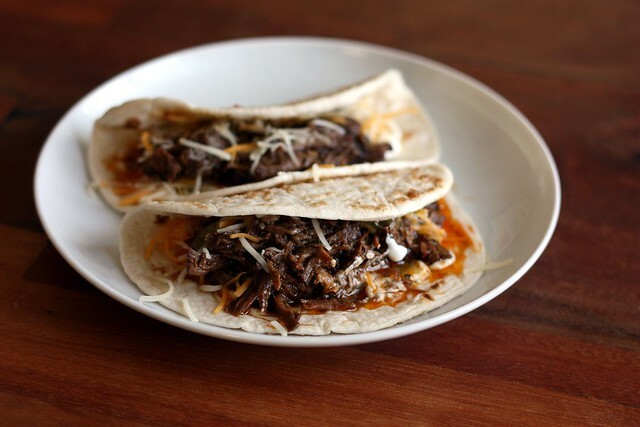 Slowcooker Shredded Beef for Tacos (or Burritos, or Nachos, or Tostadas…) – Elly Says Opa! You probably don’t know this about me, but I love Mexican food. What’s that, you say? I only have 4 less Mexican recipes on this blog than I do Greek ones? Hmmph. I had no idea. We eat chicken tacos so often that I often forget about beef ones entirely. And while I have a soft spot in my heart for the crunchy ones made with ground beef and a sodium-laden taco seasoning packet (aka my husband’s “specialty”), we haven’t had them in years. With a roast in the freezer and a craving for Mexican (because, let’s be honest—when do I not have a craving for Mexican?) shredded beef tacos seemed like the perfect solution. The beef was every bit as delicious as it smelled when I came home. These tacos are so easy and good, in fact, that I’m pretty sure I’ll be serving them at my son’s birthday next weekend. They’re a good option because it’s totally hands-off when guests are here and sides, like rice and beans, are also easy to make with very minimal prep, so I’m not stuck in the kitchen. And, of course, salsa can be made ahead of time, too. As a side note, can you believe I have an almost-one year old? Sheesh! Heat a large, heavy bottomed skillet over medium high heat, and add the oil. Sprinkle the beef roast liberally with salt and pepper. Once the oil is hot, add the roast to the pan and brown on all sides, about 2 minutes per side. Place in the crockpot. To the pan, add the onion and cook for about 2 minutes before stirring in garlic and tomato paste. After another minute, stir in the beef broth and spices. Scrape up any browned bits, and then pour the seasoned broth and onions over the top of the roast.